Welcome to Starcraft Replay ! On this website, you can find the latest Starcraft 2 News, Replays, Guides and Build Orders. Don't forget to check our home page regularly to find out about the latest Starcraft 2 Replay news, announcements, contests, prizes, etc..
Blizzcon 2010 - ticket sales started last night! 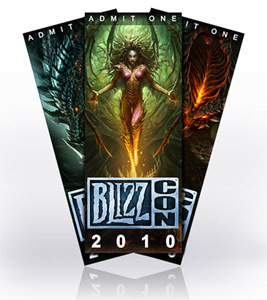 Blizzcon 2010 will take place in the Anaheim Convention Center (California) on October 22-23 later this year. Tickets started selling last night at 19h00 Pacific Time. Each ticket is worth 150$ and you can buy a maximum of 5 tickets per billing address. New starcraft 2 beta patch - patch 14! Blizzard just tweeted this to show the possibilities of the Starcraft 2 Galaxy editor, the official SC2 Map editor. Starcraft 2 beta extended until 7th june! Originally the current Starcraft 2 Beta phase was going to end this weekend and be offline for several weeks before being turned back on prior to the July 27 release. But Blizzard just decided that they wanted another week of testing, so they extended the current beta phase until the 7th of June.